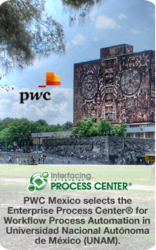 PriceWaterhouseCooper Mexico selects Interfacing’s award winning Business Process Management (BPM) software, the Enterprise Process Center® as the standardization and automation technology for Mexico’s largest educational institution, Universidad Nacional Autónoma de México (UNAM). EPC was selected following a significant bidding process where it competed amongst several established BPM providers. “We chose EPC over Bizagi BPM, Fuego BPM and Microsoft Biztalk Server because of its wide range of integrated functionality when it comes to process mapping and automation”, said PWC BAS Manager, Alfonso Velázquez Tavira. UNAM, Mexico’s largest and one of most prestigious universities has been experiencing departmental disorganization, an overload of paperwork and miscommunication leading them to commission PWC in selecting a technology that would aid in implementing quality management and standardization. “All of the BPM suites we considered had functionalities that didn’t meet UNAM’s present needs. With EPC we chose which modules we needed to address the problems we were facing currently, with the flexibility to extend in the future as UNAM’s process maturity grows”. States Alfonso Velázquez Tavira, the PWC Manager handling the UNAM project. Through an aggressive standardization strategy set out by PWC, UNAM plans to extend the automation processes between the university and it’s 130 dependencies. “EPC’s competitive licensing pricing will allow us to deploy the software to about 36,000 expected end users across Mexico in the next two years” concludes Mr. Velázquez Tavira. UNAM’s short-term objective was to automate the first five paper based institutional processes within 6 weeks from deployment, including Proceso de Vehículos (Vehicle Purchasing Process), Proceso de Arrendamiento (Leasing Process,) Proceso de Nombramientos (Promotion Process), Proceso de Boletos de Avión (Airfare Process) and Proceso de Participación Institucional (Institutional Participation Process). Previously, these processes were documented in unstandardized procedural guides, took a full day or more to complete and required several signatures before sign-off. With EPC’s Workflow, processes are now streamlined and completed electronically using customized PDF e-forms and e-signatures, and sent through established approval cycles with e-mail notifications, reducing human-centric effort which resulted in missing or incomplete paperwork in the past. “We often see these problems in large institutional and government organizations where there is a large reliance on human resources for paperwork tasks which are not value added, and otherwise can be automated and monitored through technology,” says Meir Levy, CEO of Interfacing Technologies. Interfacing Technologies Corporation is a pure-play Business Process Management software and services provider with over twenty years in the space. Interfacing has clients globally across all industries and is well recognized for their personalized customer service and 24x7 support via their international office locations. Interfacing’s BPM solutions are highly intuitively, designed for business users and cover the full spectrum of process improvement and governance initiatives. Multiple groups within the organization can collaborate and conduct diversified programs in parallel for business architecture, lifecycle management, automation, risk management and compliance, all within the same centralized process repository. Interfacing delivers the knowledge and puts the tools in the clients’ hands to continuously improve operational performance and align their business objectives and GRC strategies with daily operations.